I (that is Frances on this occasion) was recently asked to talk to IAPMA (the International Association of Hand Papermakers and Paper Artists) at their conference in Wadham College, Oxford. There were indeed papermakers from many countries discussing the intricacies of the science and art of papermaking together with workshops in many related areas. When I was invited to speak, Nick Pearson, who was organising the talks, said something about ‘Well, we must all know HOW to make paper now, perhaps we need to hear more about WHY various people want to make paper, for what purposes and with what do they achieve their aims’. 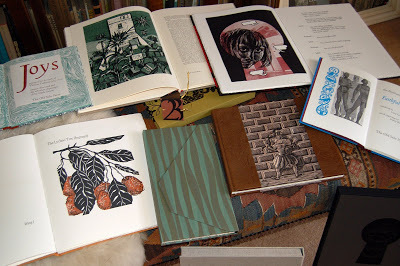 Hence I spoke as one half of the Old Stile Press where we work with artists to produce books where image and text are in an equal partnership – using materials that have some hope of lasting into future generations. There are, of course, those who say that the book is dead, now that we have the wonders of the electronic age and yet . . . we can still read printed books that have survived from the earliest days of printing and papermaking, while some of the records of recent years supposedly kept for future generations are already inaccessible because the technology to read them has become obsolete. Even without that as a spur, I suspect our press would still have happened because of our love of books – their content, their appearance, their images, their feel, the ability to hold them in your hand and enter a whole world created within that space between the book and the reader. We have always managed to do only those books we really want to do, with an artist whose work we know and like and together we create a book just as we all visualise it. Because we have always sought to do what we believe in – rather than marketing and ‘filling a list’ – we seem to have found enough people who share our vision to the extent of buying copies of the books. We have both been publishers in the ‘real world’ – I worked in promotion for the Oxford University Press (in the days when it had a music department) . Nicolas was a director of a school book publishers for many years but eventually we managed to escape to our own publishing. This involves not just the publishing ‘arm’ but the design of the book, its printing, and the design of a binding, once we have decided with an artist what we want to do together. Nicolas does the designing and printing, I make the paper for some of the books, and we both share preparing text, editing and proofreading – and then I mostly do the promotion, go to exhibitions or fairs and deal with packing, invoices, accounting and the like! We both are kept busy – and the amount of paper being made at present is less than I would like. everything and so I thought it good to try it as a fibre. Alkanet proved to make a paper with a texture we liked with silky strands in it. Irises made an interesting green and fairly hard textured paper. 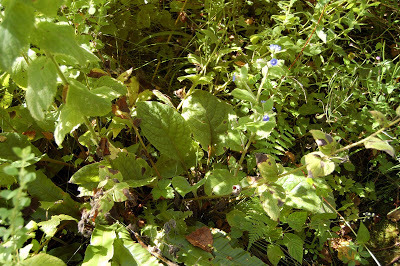 Nettles too have strong fibres and, when cooked for long enough, make a good surface. Rushes from beside the river, first near N’s parents home, then plants from beside our stream which flows into the Wye . . . such exploration of plants made interesting papers, but I never could make enough to imagine producing paper for an edition of a book. These experiments were further consolidated with some work at the London College of Printing in an endeavour to become more scientific about what I was doing. 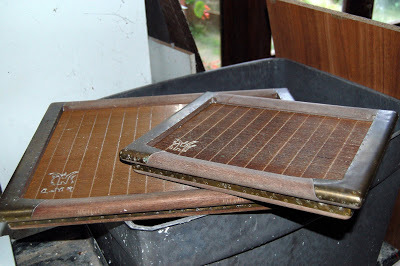 I got the feel of laboratory beaters (as opposed to domestic liquidisers which I had used before) and of larger and more efficient presses which really got the water out of a post of couched sheets so. . . I realised that to achieve a step up from the papers I had made thus far I would have to find some better equipment. Our move to Wales provided me with much more space, a large riverside meadow with woods all around – plenty of plants to explore but the greatest delight for a papermaker is the water. 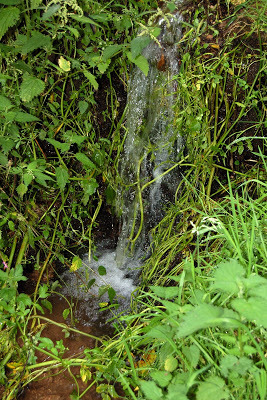 It flows straight from a spring just above the house and is piped into the house – no chemicals just pure water (in fact it is supposed to have much the same healing qualities as the waters of Bath). The area has long been a haven for papermakers – the next tributary of the Wye, the Whitebrook, had nine mills ‘piled up’ one one another in the 18 and 19th centuries. BUT I still had no reliable equipment. 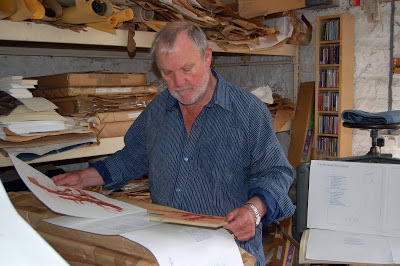 An artist friend, Reg Lloyd, who was also a friend of Ted Hughes, had seen some of the papers I was making and wanted to use some made from different plants for his images for some of Ted Hughes nature poems. This was an exciting project – however, it would require 10 sheets for each of 250 copies of Earth Dances. So I selected plants, cooked them, ‘beat’ them in a couple of domestic liquidisers together with an old butter churn redundant from N’s parents farm (which bashed rather than cutting the fibres). The plant fibres were mixed with some offcuts from papers already used in the press (so of good cotton fibres). It is a project such as this that pushes one over that barrier between an amateur and a committed craftsperson. 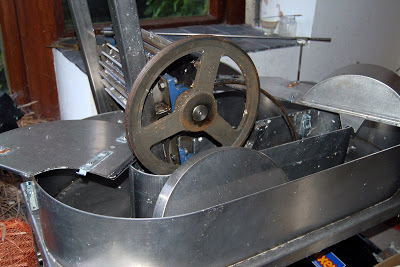 Without the right equipment it will actually be impossible to be consistent, to set up the rhythm which ensures the flow of sheets will be as even as possible, that you don’t break your back doing it, but everything is working towards that area where you achieve something that is more than the sum of its parts. From that comes the satisfaction and the justification for all the struggles. In all of this, I wanted to produce paper that would match up to the efforts that N puts in and that the artist in question puts in. 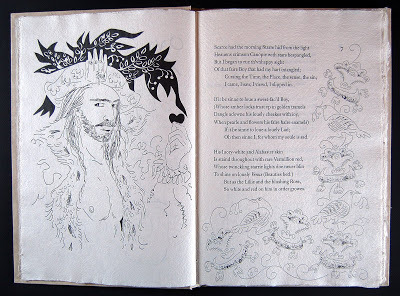 It would be a disaster if the paper fell apart on the press or was so uneven as to make type or image less than a perfect impression, so I was always diffident about the paper being used except decoratively, for covers or endpapers, or as a small alternative edition . . . 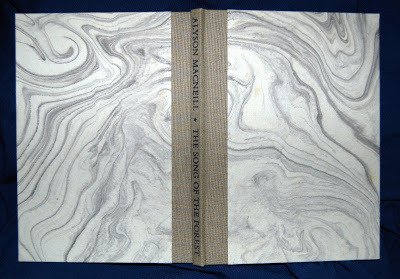 Given that it is a human being at work, no sheet is exactly the same weight as the next, the only quality control that I can do in this direction is to make rather too many sheets and select out from the pile those that are too thick or too thin and try to arrive at the right number for the edition in that way – so a given number always has to be multiplied – though I am getting better at recognising in the vat when it has got too thin and rejecting the sheets at that point! 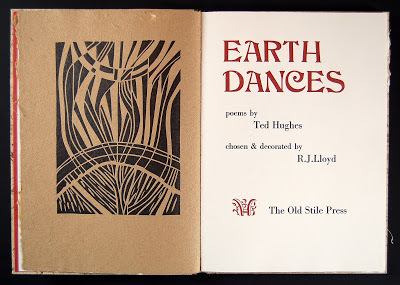 Earth Dances has been a successful book – and was in an exhibition at The British Library of editions of Ted Hughes work, some time after he had died. However, there are still one or two copies available – and signed by poet and artist! The next leap forward came when we decided upon a work The Affectionate Shepheard by Richard Barnfield – a contemporary of Shakespeare. Could I produce something that would give a feel of another century? Just as I was coming to terms with discovering a hollander beater which was of feasible size to manage at home, I also discovered that only about seven miles away I had access to part prepared hemp, jute and abaca fibres. We went to Holland to collect the beater – yes it really did come from Holland, made by Peter Gentenaar – and it fitted into the back of our car. The Barnfield book was to be completely on my paper – again 200 copies each of 56pp with endpapers which was the same stock of abaca and jute with added iris fibres. Having, I thought, completed the making of the paper for it, Peter Wakelin who was writing an article about the background to the poet and his work for inclusion inb the book, came to us with his work and said it would be up to me (wearing my editorial hat) to cut it to the available size. We agreed that it was all far too interesting and relevant to be edited down (and N didn’t want to reduce the type size to something unreadable!) so it just meant going back to the vat and making another 500 sheets. One of the more loaded editorial decisions of my life! One of the strange aspects of my making of paper is that I tend to do it instinctively – rather as I cook. I may read recipes and relish the idea of a particular dish but when it comes to it, I much more often invent and amalgamate things that seem to me to be right together or often what is available in the fridge. Having read a number of ways of going about making paper (which may include a mix of methods from the Japanese and the Nepalese as well as American and British makers) I then try to adapt what I have available and the means to hand and see what I can do . . . perhaps I was encouraged to be less rigid than the chemists would allow by an early fair at which I had a stack of my papers on display and I watched a man spending a very long time looking at, feeling, smelling them and when I engaged him in conversation it transpired that he had, I think it was six, degrees in paper engineering etc but he said that he had never in his life made a sheet of paper and he was filled with admiration that you could achieve so many of the goals that the papermaker was after in such an unsophisticated manner. And then later, we were working collaboratively in a college which taught bookbinding (no more – just as most of the courses in the UK are no more) and their technician who had previously worked in the paper trade said that he would do some of the regular tests on my paper – it failed dismally, but then he said you are not making paper to run on a series of huge fast revolving rollers, so the burst factor is inappropriate. . . and he went through the tests finishing with the conclusion that for our purposes the paper was fine and he loved the textures etc that one got from using such unexpected materials. SO. . . The one piece of ‘real’ equipment that we lashed out on very early, was a mould and deckle made by the last craftsmen at Edwin Amies and quite soon after a second one at twice the size. That does really make a huge difference to the quality of the sheet – and to the ease of making it – the way that water drains through is magic and makes it much less heavy to work with than moulds made in different ways. 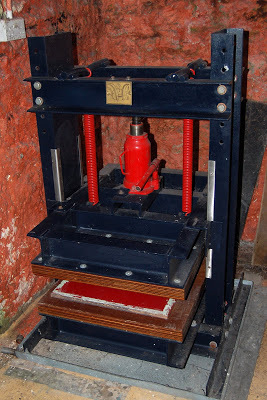 Another leap forward came from having a proper hydraulic press – I really had pulled my shoulders too frequently in tugging at the screw on an old ‘laying press’ and to be able just to pull a small handle a few times and water poured out from the post of sheets and felts was magic. That was thanks to a friend of our son who works with metal – so it is good to have the right friends! If N were here he would tell you of the excitement he gets from the physical printing of these books – as you will by now have gathered, a good deal of what goes on is through genuinely shared, joint decisions and choices. However, he spends long hours alone, (well, with Palestrina, Janacek, Mozart and Berlioz playing) while 250 sheets of paper roll rhythmically through the press, fed by hand and taken off the roller to dry in systematic piles, then more ink is added at just the right moment before the next impression so that each has an equal density of black on image and text. 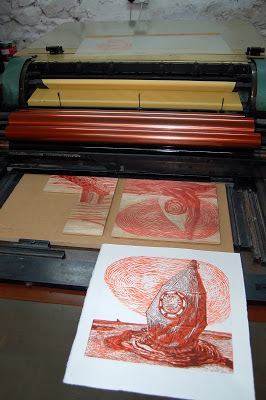 Coincidentally, he will now be doing just that with some wonderful, colourful, images – huge linocuts combined with woodcuts (which means several trips through the press for each block and different colour) by Mark Cazalet. I would think that we probably share with most of you here a constant wonder that we have chosen to make things which we love and that other people somehow see and appreciate what we put into whatever it is we make and will buy and treasure those things. When you start out it can be frighteningly slow but, with a little encouragement – however small – and a constant belief in what you are doing, the rewards and satisfaction are tremendous – and I don’t necessarily mean money! 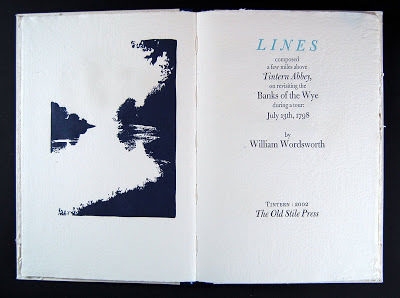 Because we have the good fortune to be living beside the Wye, just above Tintern, the time came when we felt that we HAD to print ‘our’ poem, namely Wordsworth’s Lines composed above Tintern Abbey. Nicolas took all the photographs which he modified in the computer, made blocks to print from and then printed on paper made by me – on this occasion a book totally done by us, not in collaboration with anyone else except, of course, the binders. That is an aspect of the production of a book we don’t do ourselves but it is largely hand work done by The Fine Book Bindery in Wellingborough. 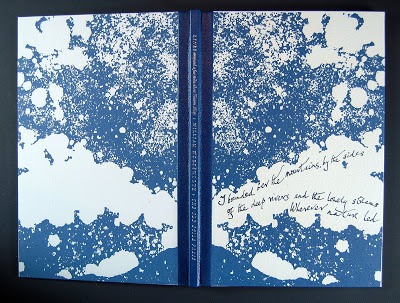 The way in which the images work means that the paper (made with water flowing into the Wye) becomes the river and the endpapers have plants grown at the riverside within them – irises give the texture. A very complete whole. Designing and printing a book requires attention to detail beyond what any of us would think necessary and yet it looks right because of that care and you might not know why it failed to please when it was not quite right. That is the lot of a craftsman – and in our view, to produce a work of art you need the skill of the craftsman in addition to the inspiration of the artist. That, then, is roughly what I said to them . . . and we thought it might be of interest to some of our blog readers to hear a little about the papermaking for some of these books. One of the people at my talk, whom I already knew quite well from exhibitions and so on, said that she had never realised just how much paper I have made or that these books were made in this way. I suppose it is always worth repeating even what seems obvious to us when we are doing it! What a lovely piece of writing Frances. Insightful and illuminating. I’d heard from Nicolas that your talk was a great success, and I can quite see why. 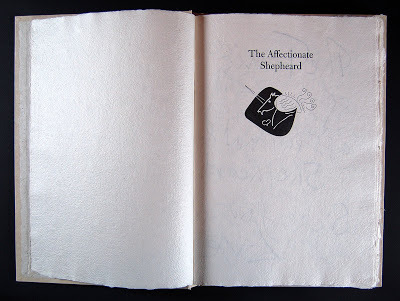 Only the other day I took one of my copies of The Affectionate Shepheard from the shelves, and the smell of the paper as I unfolded the origami-like case and opened the cover, sent my mind hurtling back to the days when you were up to your elbows in sludge at your ‘beater’ in the bowels of Catchmays, and I would bring yet another experimental variation of a ‘cliché verre’ plate for Nicolas to examine and make a trial printing from. Yours was an almost superhuman task on the book, and all the effort and anguish and…dare I say it… eventual triumph, are for me caught up in the complex perfumes of that marvellous paper. I don’t think that I’ll ever be able to read Barnfield’s lines without remembering all our adventures while bringing the book into the world, nor the sense of achievemnt and relief when we saw that first, beautiful, hard-won copy just back from the bindery. How inspiring! As a printmaker, I’ve often wanted to try making my own papers but have been daunted by the work required without the proper equipment. I’ve also been inspired in the past by films on how the Japanese make their wonderful papers. I do wish I could see your papers and books, to see and feel the textures and variations that are so beautiful in hand made work! Congratulations in being able to do your life’s work to the call of fine art and craft instead of ‘big business’ practises.